NLT announces a strategic partnership with Mapbox to deliver a new managed service offering (MSO) for Mapbox private cloud platform Atlas. The new managed hosting service provides ready to use Atlas, in the cloud, that is highly scalable, robust, and secure. The new service is offered for both AWS and Azure government clouds with options for deploying to dedicated single tenant infrastructures for added security, and will enable organizations to rapidly deploy enterprise geospatial infrastructures along with all the support needed to ensure high performance and availability. Program Manager Rob Pitts and Cloud Architect Dave Williams announced the new MSO offering at the Mapbox Govsummit and NLT’s rapid deployment model. 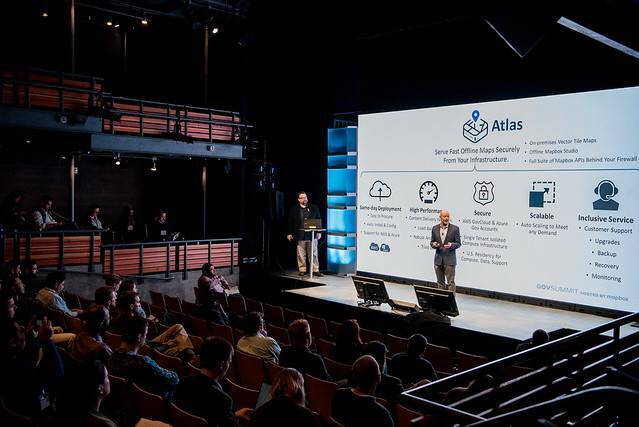 They wowed the audience by live deploying an entire cloud and application stack including the Network (VPC, Subnets, Gateways, IP Addresses), Compute (EC2 Virtual Machines), Security Rules, Atlas (App, Tiles, Studio, APIs, etc. ), and Content Delivery Network (CDN) components in under a minute! It has traditionally been a challenge for many organizations to easily procure, deploy, and maintain enterprise geospatial infrastructures to meet changing functional, security, and business requirements. Our new Mapbox Atlas MSO provides an incredibly attractive and cost-effective solution and a way for customers to quickly realize the growing benefits of the cloud! Learn more about NLT’s Managed Cloud Hosting Services.